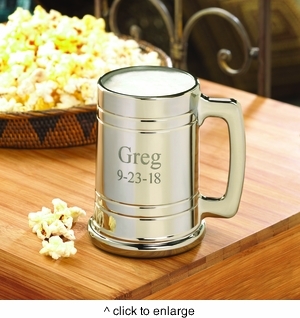 Beer drinkers and mug collectors will love this unique metal-coated personalized mug. Contemporary but with a classic feel, this personalized mug will hold plenty of your favorite brew and includes a sturdy base, slim handle, and sleek lines. Unique engraving process allows you to see right through the inscription. Holds 16 ounces. Personalize with two lines up to 10 characters per line.